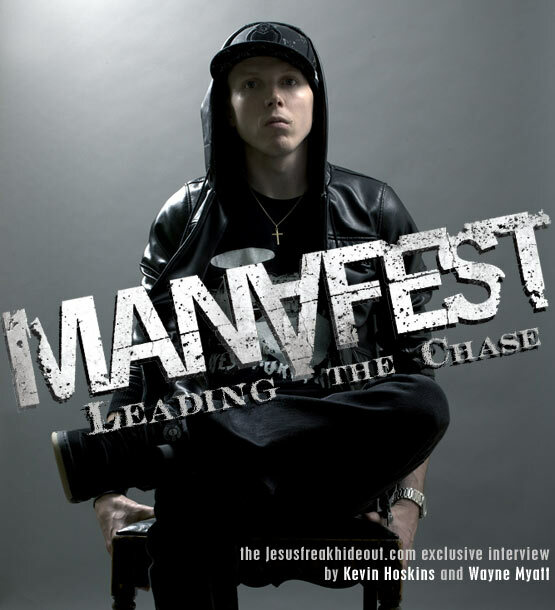 On the heels of the release of BEC Recordings' own rock rapper Manafest's fourth album, The Chase, Jesusfreakhideout.com reviewers Kevin Hoskins and Wayne Myatt shot some questions to the artist to talk about his new record. This interview took place on: 3/29/10. Jesus freak Hideout (Kevin Hoskins): Your new album, The Chase, has a little less rap and a little more rock. How did you end up with that sound in the end? Manafest: Going into recording the record I knew that I wanted to make an all-rock record, so it was definitely a planned thing. As far as the songs' content, I always write whatever inspires me or is on my heart at the time. JFH (Kevin): It seems like Thousand Foot Krutch's Trevor McNevan is all over your albums - especially The Chase. What's it like working with him? Manafest: Trevor is a good friend and we always tend to jam out great songs together, sometimes I'll have an idea already down and get him in for a hook. Or with the song "Everytime You Run," he had the chorus already written, and we built the verses/music around that. JFH (Kevin): Rap music usually contains a lot of lyrics (more than most other music genres). How do you keep up with writing meaningful lyrics consistently? Manafest: Touring and the experiences I have, places and people I meet give me a lot of content to write about. Plus, I do a lot more reading than previously, which always gives me angles to hit on. Sometimes there's writers block but that's when I put the pen down. JFH (Kevin): Tell me about your album writing process. How does it usually go when attacking a new song? Manafest: Sometimes I have an idea already and I look for the music to go with the song. Other times I jam with one of my producers and create the music first and then write the lyrics. I don't have a preference anymore, just as long as it comes out dope!! JFH (Kevin): How did you end up working with Dustin Antsey? Manafest: Dustin is on “Breaking Down The Walls” and “Better Cause Of You,” produced by Tyson, and Dustin is his brother actually... So he hooked us up. He also played the guitars on those two tracks. JFH (Kevin): Can you explain the song "Breaking Down Walls?" JFH (Kevin): Tell me about the song "Every time You Run." Manafest: It's so easy to hide and run from our problems until the point they build up and it becomes to destructive to our lives and the people around us. I speak about someone who eventually gets so low and desperate that they call out to God for the answers. He remembers a song he used to sing in church that touched him a long time ago. I think it's amazing how we can relate to music and the power it has to send singles and trigger emotions in our heart. JFH (Wayne Myatt): The new album is great! Can you tell us the meaning behind the song, "The Chase?" JFH (Wayne): Did you ever think you would come this far as musical artist? Manafest: I didn't know what I was doing when I first started in this industry and God has blown my mind to as far it's gone and starting to go. JFH (John DiBiase): “Married In Vegas” is certainly an interesting track lyrically. What's the story behind it? Manafest: I wish I could tell you. :) I had a lyric I was writing in my studio, and all of a sudden it took that direction. I think I painted a cool picture in the first few verses. It kind of sticks out on the album a bit, not sure if it fully meshes with the rest of the record, but a fun track nevertheless. JFH (Wayne): What are some of your greatest influences in music? JFH (Kevin): Are you touring? Any plans to make it to the US this year? Manafest: I'm always touring -- 150 plus shows a year. I'm coming to the US in June/July and September!!! JFH (Kevin): Do you still find time to skate much with the busyness of a music career? Manafest: Always! But I need to take more time. Just depends on the weather. JFH (Kevin): Has God been teaching you anything new lately? Manafest: Yeah, I was reading a lot of the scriptures that talk about us being salt and bringing flavor to the world. I think that's a pretty cool comparison. I want to bring flavor to people and light when life can be so dull and meaningless to so many people. JFH (Kevin): Any last comments? Manafest: Thanks to all my fans who supported me, this really is my best record, hope you dig it too!! !